On this site, you’ll find LOTS of recommended children’s books for kids age 3 – 7 (preschool to second grade). In each weekly blog post, I cover one particular STEM topic and all the activities we did to teach it, including books specific to that theme. So, be sure to check those out. On this page, I’ve collected some of my favorite books about people who dream, invent and build. Our Inventors class strives to inspire kids to explore and to “make things”, and the stories we tell are definitely an important part of that. 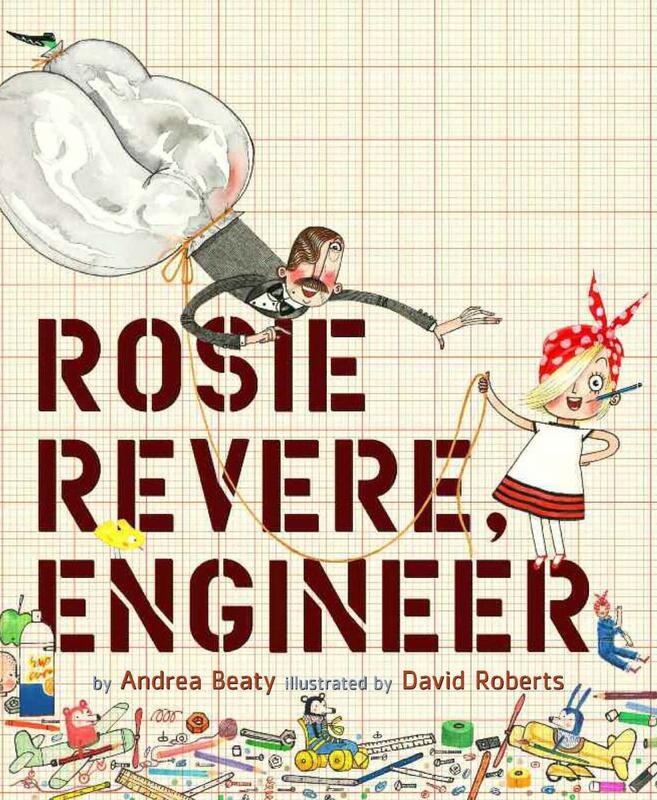 Rosie Revere, Engineer by Beaty. Rosie dreams of being an engineer, and builds cool stuff out of trash, but then her uncle laughs at her and she stops inventing till Aunt Rose (Rosie the Riveter in her later years) comes to visit. They build a heli-o-cheese-copter. It only flies for a moment and Rosie is discouraged, till Aunt Rose says “it’s the perfect first try! This great flop is over, it’s time for the next”. They keep building together. (Great read for any of our Engineering classes or for Flight week, although there’s lots of other great flight books to choose from, like Violet the Pilot .) You might also enjoy two other books by Beaty: Iggy Peck, Architect – we read it in Bridges week and Ada Twist, Scientist . Going Places by Reynolds. A class is challenged to a “Going Places” contest, then all given identical go kart kits. Rafael is very excited about the project, and assembles the kit PERFECTLY, according to the directions. Then he discovers his neighbor Maya is dreamily watching birds and not building her kit. She builds a fabulous contraption, but it’s not a go-kart. She and Rafael team up to build an amazing and unique go-kart… that FLIES! At the end, they get an even wilder idea for what to build next! This is a very engaging story, not just about building but also about inventing. Bonus points for ethnically diverse characters and gender balance. Age 4 – 7. A good option for Build a Car theme, or Contraptions or Flight. 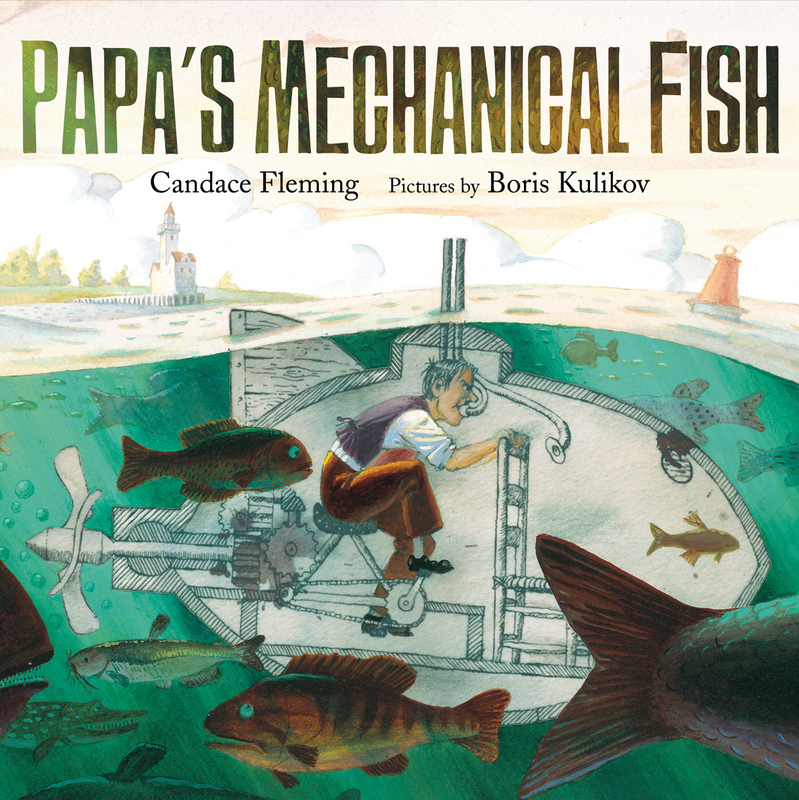 Papa’s Mechanical Fish by Fleming and Kulikoff. 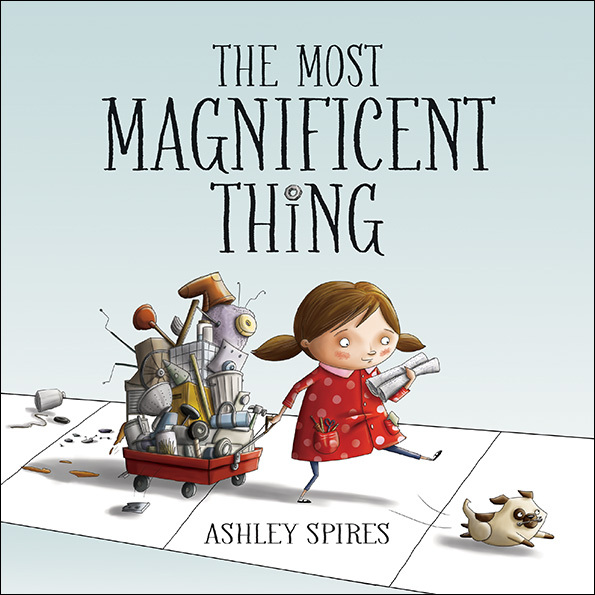 A really well-written and enjoyable book that shares the adventures of a family where the father is an tinkerer. His inventions are never quite successful – they “almost work”. He is inspired to make a mechanical fish, and after several failed attempts makes a submarine the whole family can ride in. We read it when studying Sink or Float or Submarines. What Floats in a Moat? by Berry & Cordell. 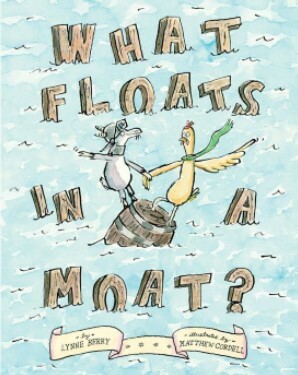 Very silly and entertaining, great read-aloud that tells about Archie the Goat (named for Archimedes) and teaches about the science of Sink and Float. “Archie the Goat stopped short at a moat. He measured and mapped. He doodled and drew. He sketched and scribbled and scrawled. ‘Aha. To cross the moat,’ announced the goat, “we build a contraption to float!” When Skinny Hen suggests they could take the drawbridge, Archie says “Bah… This is no time for a drawbridge. This is a time for science!” He proceeds through 3 attempts (“he hammered and nailed, clanged and banged”) till he successfully gets across the moat on a half full barrel of buttermilk. 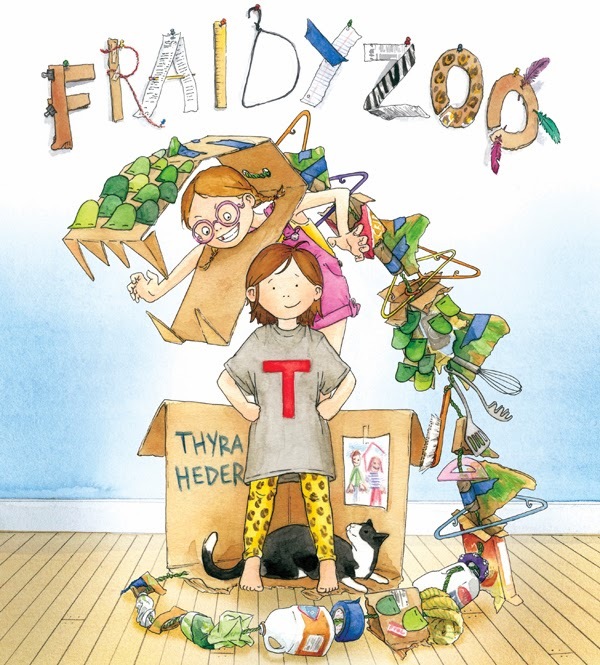 Fraidyzoo by Heder. Little T is feeling afraid of going to the zoo, but she can’t remember which animal she is afraid of. Her family says they won’t go to the zoo till they figure it out. They then spend THE REST of the day going through the alphabet, asking “does it start with an A (miming an alligator) or B (holding a red scarf for a bull) or C (using a blanket and three people to form a two humped camel). It gets more and more complex, as they build animals from bubble wrap, cardboard, oven mitts, mops, umbrellas, empty water bottles and more. By the end of it all, little T is excited to plan a zoo trip for the next day. But then at the zoo, her big sister is frightened away by the ticket sales lady. So, they go home and role play that out too! 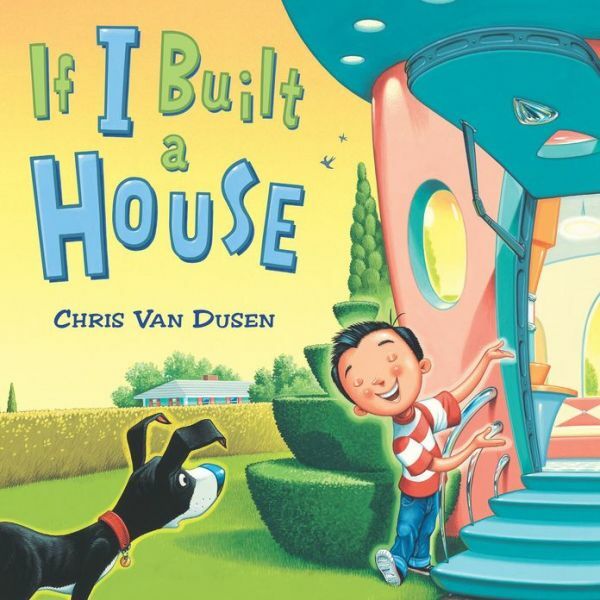 Nice book about a family playing together, building together and empathizing with each other’s fears. Age 3 – 7. May be a good read for Adaptations week, when we’ll be talking about various animals. Could be fun to try to build some animal costumes from our recycled materials supplies! Also, check out the books from Robots week, like Awesome Dawson and Clink. Inventor McGregor by Pelley and Chesworth. A story of a man who lived in a higgledy-piggledy house with a cheery wife, five children, and a hen called Hattie. They call him Mend-It McGregor because he fixes everything that breaks in his village. He also invents new things to fix his neighbor’s challenges. He is a very happy man. But then he’s recruited by the Royal Society of Inventors and taken to work in a lovely, quiet, well-furnished lab. Away from the chaos of his community’s life, he is lonely and sad, and also can’t come up with any ideas for what to invent, and returns to his village. Ages 4 – 8, but too long for circle in a group setting. Anything Is Possible by Belloni and Trevisan. Age 4 – 6. A sheep watches birds flying. She runs to her friend wolf who is a scientist / inventor and asks him to build a flying machine. After initial reluctance, he gets out his triangle and protractor and they starts to sketch (cool DaVinci style sketches of gears, screws, wheels….) They gather materials and build. They launch and fail, rebuild, launch and fail, rebuild, launch… and fly! It’s a fun read, great illustrations (though I find adults like them better than kids do), and good modelling of trying again. Not much explanation of any science of how the thing is supposed to actually fly…. kids won’t care, but some adults prefer more practical books. 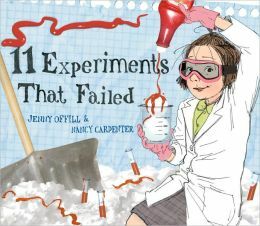 11 Experiments That Failed by Offill and Carpenter. Here is a sample experiment: “Experiments with Perfume. Question: Will seedlings grow if given Eau La La instead of water? Hypothesis: Seedlings will like Eau La La better than water. What you need: pots, dirt, seedlings, water, fancy perfume. What to Do: Place dirt in pots. Plant seedlings in dirt. Water one pot with water. Water other pot with perfume. Watch. What happened: Mom cried. Seedlings died.” This is fun and silly and would be my recommended book to read on a week when you discuss the scientific method. We read it when talking about Chemical Reactions. Henry’s Amazing Machine by Dodds and Brooker. About a boy who invents from the day he is born till his house is filled beyond overflowing with an “amazing machine” with “dripping things, dropping things, pushing, pulling, stopping things… you sure know ho to build things. But Henry, what does it do?” Henry hasn’t a clue until the local carnival announces it is closing down and he moves his machine there. This is a fun read that kids will engage in. Age 4 – 8. Could read for Contraptions week. The Big Ideas of Buster Bickles by Wasson. A child is full of big ideas and invents crazy stuff. He takes it to show and tell and kids laugh at him. But then his Uncle Roswell has invented the “What If Machine” that can make any idea into reality, but Uncle can’t come up with any big ideas. So Buster shares plenty of his. 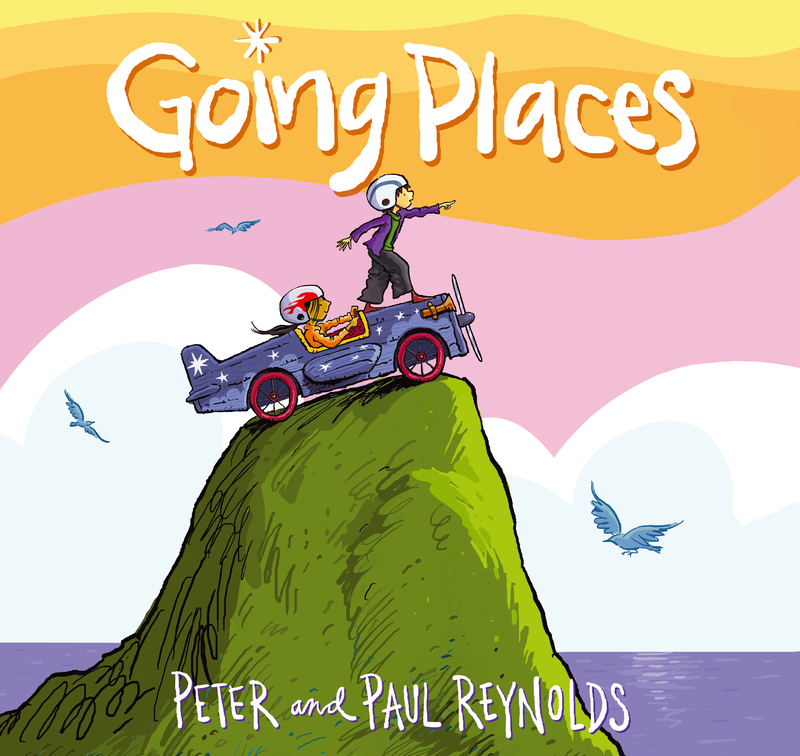 Great read-aloud for ages 3 – 6. The Dumpster Diver by Wong and Roberts. Tells the story of Steve the Electrician the dumpster diver, and his assistants: Hose Handler, Hose Handler 2 and Fauceteer. After he dives, they help hose him off. Then they build: they first draw, then measure, drill, and saw and build fabulous things. They turn a blender into a lamp, an old lamp into a table and so on. Pros of this book: encourages building and inventiveness, encourages re-use of used materials instead of sending to landfill. Possible concerns for some children / families: When Steve dives in a dumpster, LOTS of beetles, roaches, and spiders splash out. There may be some people who are troubled by this illustration. In the end, Steve gets cut up by broken glass and rusted metal in a dumpster. One Amazon reviewer liked that this was a cautionary tale that told kids that it wasn’t maybe such a good idea to dumpster dive. Another Amazon reviewer said her children found it very frightening. My 5 year old loved it – no worries for him. Would be a good addition to Contraptions week. Cleonardo, The Little Inventor by GrandPre. Age 4 – 8. Cleo lives with her father and her grandfather Leonardo. (Illustrations indicate the setting is perhaps Italian renaissance, and the grandfather may be da Vinci.) All of her ancestors and elders were inventors and makers, and Cleo is too. But her father doesn’t always welcome her help. On her own, she makes a whirligig and a moon of twine and butterflies using her grandfather’s tools and natural materials gathered in the forest. Her father makes a mechanical bird. Things don’t go as planned at the Festival of Inventions, but her father now always works side by side with her. Ziggy’s Big Idea by Long and Joni. About a boy on a shtetl who loves to invent things – though they don’t always work, His father sells rolls for the baker, and Ziggy comes up with the idea of putting a hole in the middle of the boiled and baked rolls to help them cook evenly – inventing the bagel. It’s a fine story which highlights Jewish culture. Marveltown by McCall. I LOVE how this book starts out: “In Marveltown… we were born to brainstorm: in a city created by inventors, we saw man-made wonders wherever we looked… from rocket-jumping by moonlight to fishing from a mile-high tower, Marveltown kids thought fun without a challenge was no fun at all.” Then it tells of the cool things it invents. So far – fabulous… but then it becomes another story about rampaging robots and how the kids defeat them with their inventions. If I read this in class, I might just read the first half, as there’s only so many rampaging robots stories you want to read in a year. The Fantastic Undersea Life of Jacques Cousteau by Yaccarino. I love this book! The illustrations are fabulous, there are quotes from Cousteau mixed in that capture the magic of his work (“The sea, once it casts its spell, holds one in its net of wonder forever”), it starts with Jacques as a young boy who likes to tinker and then moves us through the history of all of his inventions and research in a way that engages us in his dreams and his motivation to keep pushing science forward in pursuit of his dreams. Best for age 4 – 7. Balloons over Broadway: The True Story of the Puppeteer of Macy’s Parade by Sweet. A Caldecott Honor winner. Great story that starts with a child who “loved to figure out how to make things move….” As an adult, he becomes a marionette and makes his way to New York City, where he then makes window displays for Macy’s, and eventually invents the giant helium balloons that first appeared in the Macy’s Thanksgiving Day parade in 1928. Engaging story-telling, nice illustrations and graphic design, and a celebration of both imagination and hard work. Plus, some American cultural history. Best for ages 6 – 8. The Great Idea Series, includes books such as In the Bag! : Margaret Knight Wraps It Up and All Aboard! : Elijah McCoy’s Steam Engine by Kulling. Very nice biographies, that start with the inventor as a child, which helps students to relate to them, focus on one early invention, and then briefly address the inventor’s longer career. They’re pretty wordy. Best for 6 – 8 year olds. With my class of 3 – 7 year olds, I write my own abridged version of the story that’s only about 30 – 40% as long as the original, I print it up, and I tape it to the back of the book so I can hold up the book to show the pictures, but read a much shorter and simpler language story. Bonus: includes female and African-American inventors. Now & Ben: The Modern Inventions of Benjamin Franklin by Barretta. (And his other books, Neo Leo: the ageless ideas of Leonardo da Vinci and Timeless Thomas: How Thomas Edison changed our lives.) These books are well written, with nice illustrations and an engaging style. They’re best for ages 6 – 9, and a bit long, so I don’t use them as read-alouds in my class for 3 – 7 year olds. Now and Ben has a fun approach where the left page in each spread talks about “Now” – something we do or use now, and the right page talks about “Ben” – what Ben had to do with the invention or implementation of that idea. These are great books! They’re more about imagination than they are about actually building and inventing real physical objects, so they don’t make my cut of books for inventors and makers, but are well worth the read. Not a Box and Not a Stick by Antoinette Portis. These two books have an unseen adult asking questions like “What are you doing on top of that box?” “Are you still standing around in that box?” “Hey be careful with that stick.” “Look where you’re going with that stick.” And our protagonist (bunny in Box, piglet in Stick) repeatedly responds “It’s not a box / stick.” And we then get to see what they are imagining it is. (A pirate ship, hot air balloon basket, drum major’s baton, caveman’s spear). Very fun books about imagination, and about the idea that a simple toy can inspire all sorts of imaginative play. If you like these books, read 5 Best Toys of All Time. Roxaboxen by McLerran and Cooney. A story of a place that to adults might appear to be a rocky hill in the desert with some trash in it. But to the children, it’s a magical village. “A town of Roxaboxen began to grow, traced in lines of stone… the old wooden boxes could be shelves or tables or anything you wanted…. Frances built herself a new house outlined in desert glass… Later on, there was a town hall. Marian was mayor, of course, that was just the way she was. Nobody minded.” A celebration of imagination and children’s creations when left to unsupervised play. Ages 4 – 8. The Tin Forest by Ward and Anderson. The books on this list tend to be energetic and rollicking adventure stories. The Tin Forest is something very different. It’s a quiet, gentle parable of an isolated man who lives alone by a junkyard who dreams of forests, then builds a forest from junk, then the real animals and plants come to live there. Lovely. Ages 4 – 8. Great read-aloud. Could perhaps read in Plants and Seeds week? The Greatest Inventor of All Time: Flint Lockwood is based on The Cloudy with a Chance of Meatballs movie, and just isn’t that great a book. The Extraordinary Mr. Qwerty. I want to love this book. But it’s just too metaphorical, and although kids are fine with reading the book, I just don’t think they grasp the meaning it or really engage with the story. Sydney’s Star by Reynolds. Another one I want to love. It starts so delightfully: “Sydney loved to build things. She made brilliant birdhouses, charming cheesecakes, and all sorts of wonderful inventions. Sydney was inspired by the world around her.” Sydney invents a great mechanical star that floats and blinks and spins. She takes it to the science fair. Great book up to here. But then somehow, the star hears a distress call out at sea, flies out, communicates with the captain using Morse code and leads him safely to shore. There’s absolutely no reason for us to think the star she invented could do any of these things, so the lack of logic means the book doesn’t work for me. What You Do With An Idea. Some people love it. It feels to me like a book that’s trying to inspire discouraged youth / adults to follow their dreams, not something that resonates with small kids. Note: I’ve included Amazon Affiliate links for all the books I recommend, so you can learn more about them, and either purchase them (I get a small referral fee) or check them out from your local library. 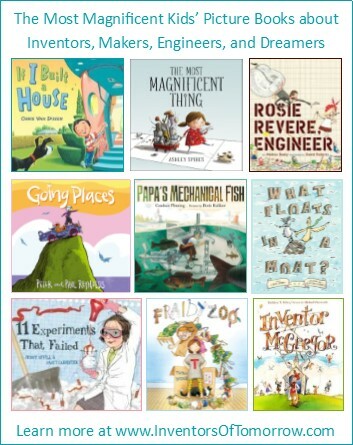 100 Recommended Kids’ Books about Engineering and Simple Machines. Children’s Book Council Best STEM Books of the year.